In Genesis 2:7, we read that "God formed man from the dust of the ground, and breathed into his nostrils the breath of life; and man became a living soul". After God formed Adam, He breathed the breath of life into him, and as the scripture says, his soul became alive. His intellect, emotions and will sprung to life, enabling him to reason and function as a living being. 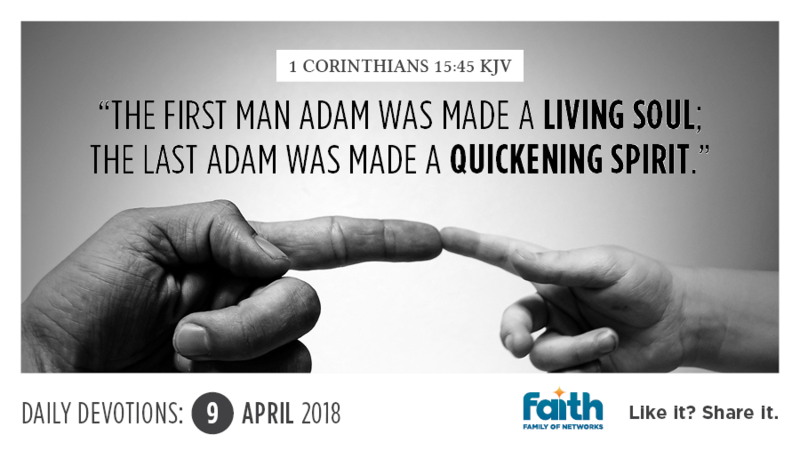 In 1 Corinthians 15:45, the Bible states that although Adam was made a "living soul", the last Adam, Jesus, was made a "quickening Spirit"; or as another translation says, a "life-giving Spirit." Now, we know that through sin, mankind lost the indwelling life of God. However, because of Jesus, we can once again have His life-giving Spirit dwell in us. We have become alive in Him, intricately connected to eternity by our spirits that are now one with God's Spirit. We have the life and power of God coursing through us every moment of every day and night. When we understand this, and yield to the flow of God's unfailing love and power that is constantly being poured into our hearts by the Holy Spirit, nothing can stop us from extending His life and power and love to those around us. When you wake up in the morning, begin your day by declaring you are alive in Christ, and have His life and wisdom and power flowing through you, straight from God Himself! There is nothing you will face that He hasn't already given you all you need to overcome. So rejoice in Him, and draw from His life that's in you today.